When you're down in the Loop, you're focused on one thing, and one thing only: Q2 projections where you're going for lunch. Which's why we asked Dennis Lee -- veteran Loop food writer and host of the upcoming web series Table for One -- to hook us up with a list of Chicago's 15 best lunch counters Downtown. 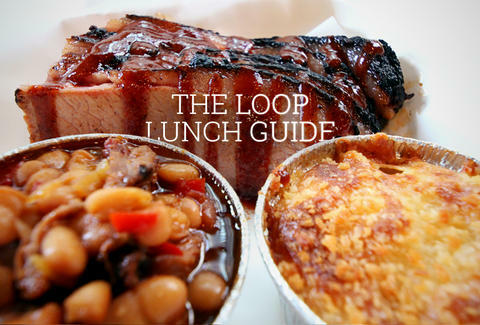 "Blackwood BBQ is one of the few barbecue options in the Loop, but it’s by far the best. All the meat is prepared the traditional way: smoked low and slow for hours until it's tender and flavorful. I prefer the brisket. The ordering process is similar to Chipotle’s; pick your protein, a format (sandwich, salad, platter), and a sauce. 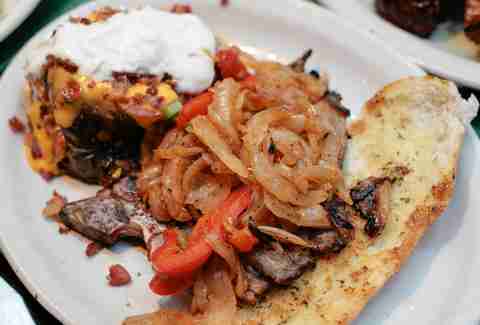 Finish it off with homestyle barbecue sides and a glass of lemonade." 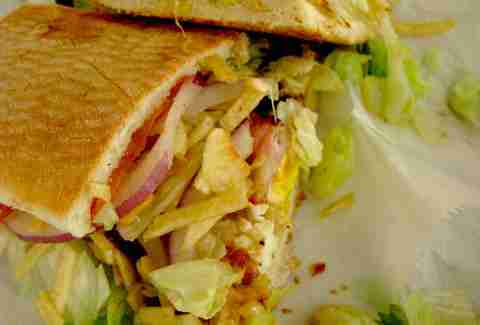 "Cafecito serves one of the best Cuban sandwiches in the city, which is why the place is consistently slammed during lunch hour. If you’re looking for something even more substantial, the Chivito sandwich is piled with steak, ham, bacon, and a fried egg. Carnivores, rejoice." "You kind of have to see Ronny’s to believe it. Their menu is huge, and most people opt for the steak. Their 8 oz steak special comes with a baked potato, salad, and garlic bread. Granted, at that price, you’re not getting a 45-day, dry-aged hunk of beef, but come on, a steak lunch for $8? And there’s something about ordering your steak cafeteria-style that just screams cafeteria-style steak 'Chicago' to me." "Saucy Porka is among the most unique restaurants in the Loop, fusing together flavors from Puerto Rico, Korea, Japan, China, and Southeast Asia. 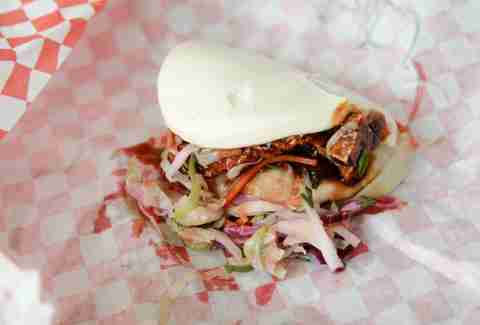 One of the more playful items on the menu is called a 'baco', which is a cross between a traditional steamed Chinese bao, and a taco." "When I first came upon Pierogi Heaven, I was instantly charmed. There aren’t any other big places in the Loop that serve Polish food, and there’s something insanely satisfying about being able to walk in and order a ton of pierogi and kielbasa for lunch, especially in the dead of Chiberia." 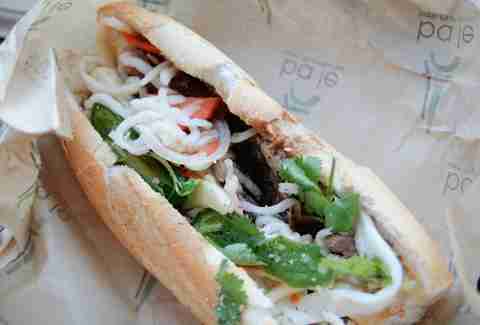 "Done properly, bánh mì sandwiches are a true thing of beauty. Start with a light, fluffy baguette with a crackly crust, pile ingredients like ham, pork roll, and pate in there, pack in some pickled carrots and daikon, a few slices of fresh jalapeño, and finish with a swipe of buttery mayo. Ba Le does basically all of that, and super well, which's why they’re always so busy at lunch." 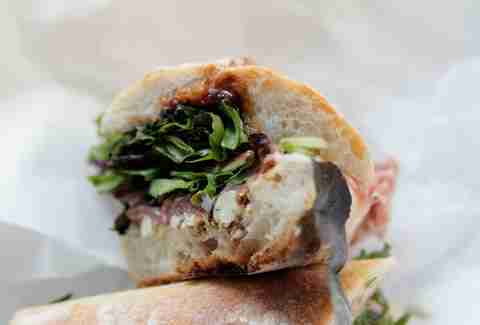 "If you’re a fan of Italian subs (Editor's Note: you totally are), you can’t miss Fontano’s. Their Blockbuster is a monster, jam-packed sandwich with ham, salami, capicola, Provolone, and Swiss. If you’re feeling more like Tony Soprano, the Wise Guy is just as good, with prosciuttini, capicola, Genoa salami, and Provolone. You’ll smell like your sandwich for the rest of the day, but who said that was a bad thing? No one. No one said that was a bad thing." "You might think it’s crazy having a vending machine appear on this list, but this machine is no joke. 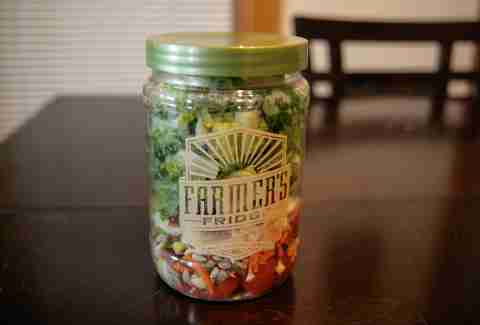 All the salads come in plastic Mason jars and feature organic, locally sourced ingredients, and they’re actually really good. The machine is completely restocked every morning to ensure you’re getting only the freshest food, plus, come on, you’re being served by a robot." "Located on the ground floor of Chicago’s historic Monadnock Building, Harry’s serves tasty, toasted sandwiches. Plus, the owners of Harry’s Sandwich Shop could not be nicer people -- it’s a true mom-and-pop restaurant." 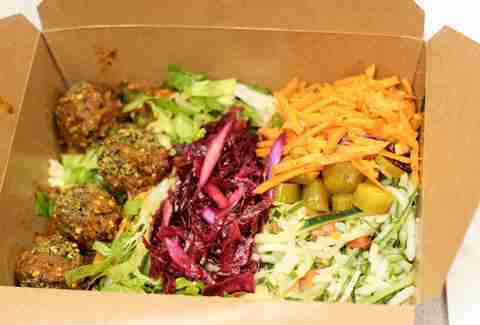 "Don't get hung-up pronouncing this name, instead, get hung-up on BenjYehuda's killer chicken schawarma sandwiches, which come with a bevvy of toppings like hummus, salads, Mediterranean pickles, and lots more good stuff. But do not, I repeat, DO NOT forget the fries. They’re golden, slightly greasy (in a good way), crisp, and pillowy, and BenjYehuda veterans order them with a side of Merkts cheddar cheese." "The Loop is surprisingly devoid of the hot dog stands that Chicago is so famous for. 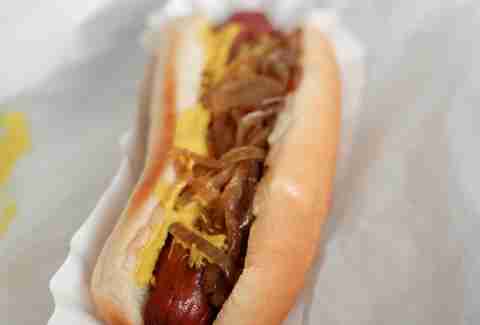 The one shining beacon in the hot dog desert is Max’s Take Out. If you want a classic Vienna hot dog in a snappy natural casing, look no further. 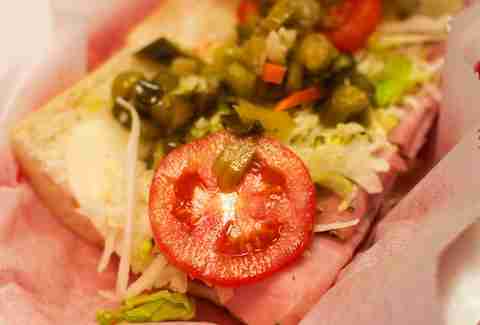 They serve other favorites, too – like Polish sausage and Italian beef sandwiches." 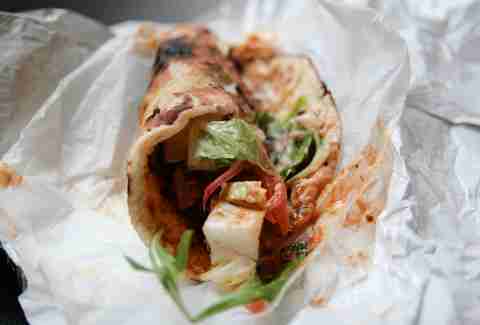 "One of the new kids on the lunch block, Naansense does Indian-inspired wraps using their namesake naan flatbread. The chicken is rich and slightly smoky, and the lamb is juicy and tender. What really sets Naansense apart from most places, though, is their fun selection of Indian sauces like makhani, korma, madras, and vindaloo." "Pastoral is mostly known for its well-curated selection of cheeses (it is, after all, a cheese shop), but they also serve sandwiches decked with gourmet ingredients like Serrano ham, duck confit, locally sourced turkey, and, yep, cheeses." "Chicken Planet is a favorite standby for a lot of people who work in the Loop. There aren’t a lot of places that serve whole roast chicken on the bone, and for that cheap, either. Don't focus on the sides, it's all about the well-seasoned, tender chicken (and make sure you get a grilled pita, too)." Follow the misadventures of Dennis Lee on Twitter at @FartSandwich (yes, that's his real handle). Sean Cooley is Thrillist's Chicago Editor, and he's noticed that a pie tin is a handy pie chart for how much pie you've eaten. Follow him @SeanCooley.